Your costumes are beautiful and inspiring. I have dibbled and dabbled in belly dancing since 1975, but I have never had the guts to dance in public. But it is time to "come out of the tent". I want to perform in public before the turn of the century! Eighteen years ago I bought a beautiful ethnic style coin belt that has over 250 coins. I would like to make a coin bra to match. Do you know of any place where I can buy coins? I applaud your desire to perform in public and overcome your shyness. That's a big hurdle and it feels good to get over it. You asked how to make a coin bra to match your belt. "Match" is the key word. A variety of coins and ready-made coin bras are available, but the type of coin varies. If you chose the wrong type of coins for your bra it would clash with your belt. The coins need not match exactly in design or size, but they should be compatible in weight, color, and style. Thus if your belt used "real", heavy ethnic coins with drilled holes in a dull finish, and the bra was covered with little shiny, tinkly aluminum coins available in costume supply stores, that wouldn't do at all. Many Arab import shops have several types of brass and nickel coins with a medium weight, as well as ready-made costume pieces. Coin shops might have foreign coins suitable for the purpose. 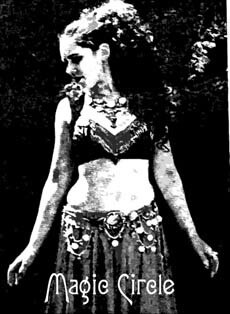 Surf the web — there are many vendors who sell either real or imitation coins for use on belly dance costumes. Obviously, you'll have to do some shopping with your belt and compare the look and feel of the belt with the coins you're considering purchasing. Ask The Costume Goddess: Attaching Coins, Beads, Bells. How to securely attach trims to your costume. Ask The Costume Goddess: Shopping for a Large-Sized Bra. If your cups runneth over, here's how to shop for a large-sized bra to use as a costume base.